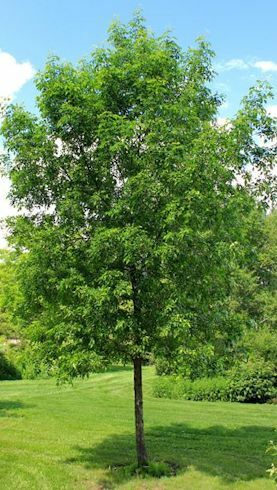 Green Ash or Red Ash is a species of ash native to eastern and central North America, from Nova Scotia west to southeastern Alberta and eastern Colorado, south to northern Florida, and southwest to eastern Texas. It has spread and become naturalized in much of the western United States and also in central Europe from Spain to Russia. It is a medium-sized deciduous tree reaching 35 - 75 feet tall. The bark is smooth and gray on young trees, becoming thick and fissured with age. The winter buds are reddish-brown, with a velvety texture. The leaves are compound with seven to nine (occasionally five or eleven) leaflets, with serrated margins and short but distinct. The autumn color is golden-yellow and depending on the climate, Green Ash's leaves may begin changing color the first week of September. The flowers are produced in spring at the same time as the new leaves. It is the most widely distributed of all the American ashes. A pioneer species, it naturally grows along streambanks and disturbed areas. The large seed crops provide food to many kinds of wildlife. It is seriously threatened in some areas, particularly Michigan, by the emerald ash borer, a beetle introduced accidentally from Asia to which it has no natural resistance. The spread of emerald ash borer was facilitated by the extensive use of green ash as an ornamental tree in the central US following the loss of American elms in the 1950s-60s due to Dutch elm disease. That epidemic was the result of a similar overuse of elms in urban environments, leading to a monoculture that lacked any disease or pest resistance. Both American elm and green ash were extremely popular for this purpose due to rapid growth and tolerance of urban pollution and road salt, so many housing developments in Michigan were lined from end to end with ashes, a result of which the beetles had an enormous food supply to boost their population. After the lesson of these twin disasters, urban planners in the region began a more sustainable planting program with a mixture of lindens, oaks, maples, and other trees to prevent a monoculture from existing again. The emerald ash borer proved to be a far worse and potentially more serious threat than epidemics of the past such as chestnut blight and Dutch elm disease because those diseases spread at a slower rate, only affected one species, and did not kill the trees before they could attain reproductive maturity.